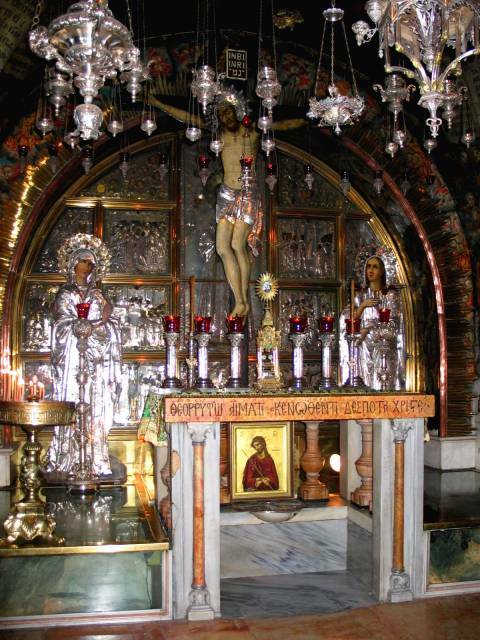 In the Church of the Holy Sepulchre. I'm afraid that despite the obvious beauty of the church, it left me cold. It seems to me to be a very strange mixture of the touristic and the religious. Hordes of tourists gazing around, many probably not even knowing or understanding the significance of the place; many more indulging in ostentatious displays of piety, whilst the various schismatic religious fanatics compete with each other. The final straw came when I was in the queue to go into the actual chapel of the tomb, and was physically assaulted, not once, but twice, by some ghastly orthodox priest. I did fall off a step. I'm afraid that for me is the real face of Organised Christianity - pushing around women, whom they regard as second-class citizens, or worse.